**Colours may vary slightly due to the difference between a digital and a fabric colour** Ajrakh is usually found in Kutch (Gujarat) and Barmer (Rajasthan). 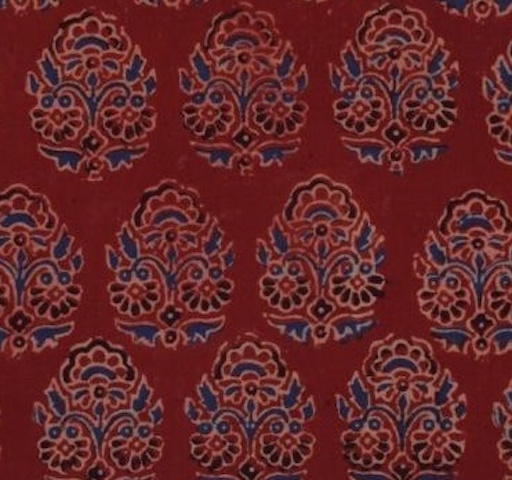 Woodblock stamps are used to create different geometric patterns that are transferred onto the fabric using natural dyes, including vegetable and mineral dyes. The most common colours used include blue, red, black, yellow and green. One of the most common dyes used for this type of printing is indigo. 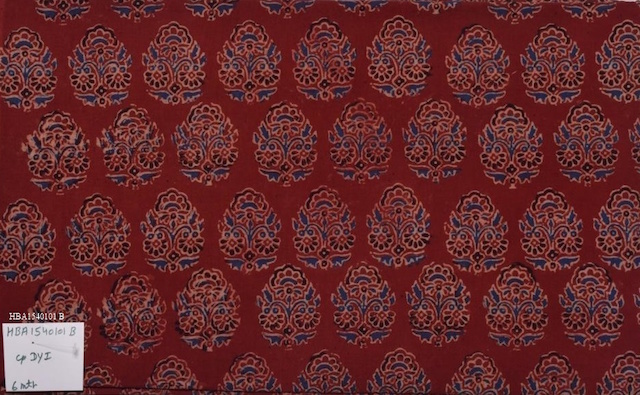 Ajrak has been dated back to Mohenjo-daro, where the kings and royals have been shown wearing similar prints to those observed in ajrak patterns today. The beauty of ajrak is in its simplistic yet elegant patterns and natural texture. Fabric: 100% Cotton Width: 44 inches Care Instructions: Natural dyes are used in printing all the designs in this fabric, so minimal colour bleeding is observed in the first and second wash. For the same reason, separate hand wash and/or salt water soak is recommended. For long-lasting bright colours, do not dry under direct sunlight. No shrinkage is observed. Note: As it is a hand block printed fabric with natural dyes, there can be slight irregularities in the fabric in terms of the block/colour. However, this is the beauty of the fabric and the authenticity of the art itself.